Your home’s entryway is like the cover of a good book. It sets the tone for what is inside and draws in your guests. It also begins your home’s story and sets the stage for what is to come. However, beyond being beautiful, your entryway needs to be functional. You need a place to contain all of your boots, bags, keys, scarves, dog leashes and other sundries. This can be a challenging task, depending on the size and layout of your space. 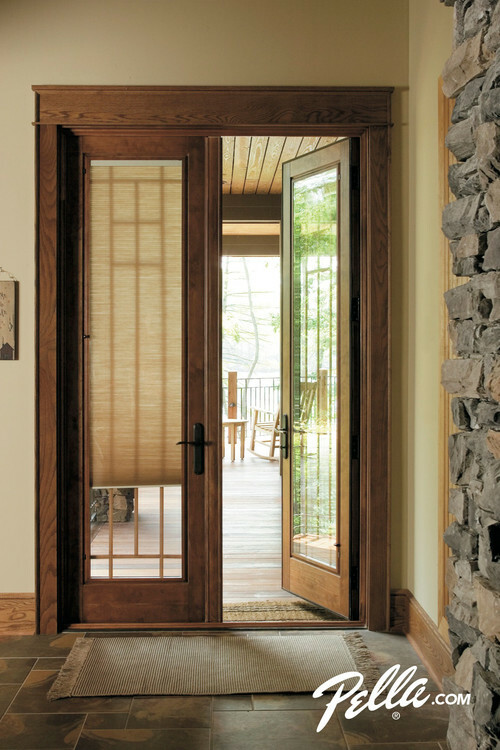 Regardless of the space you have to work with, creating an inviting entry that fits your needs is possible. 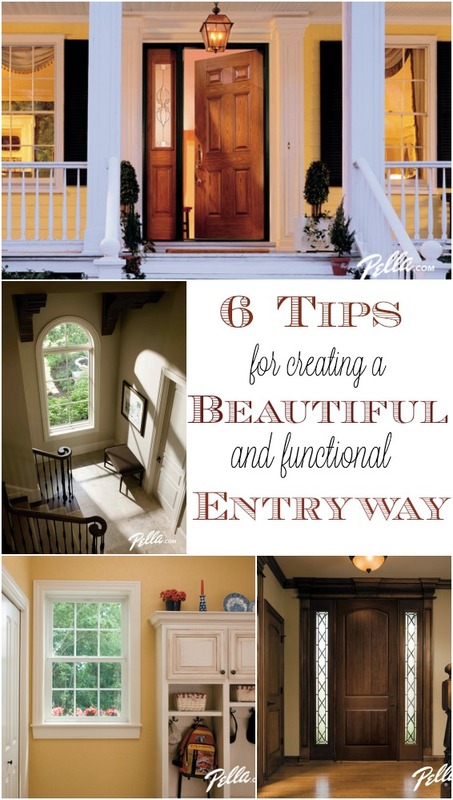 Here are my 6 tips for creating a beautiful and functional entryway. 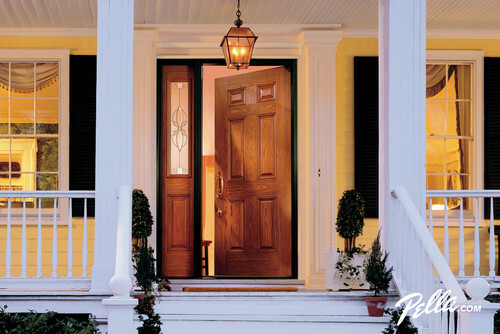 An eye-catching front door serves as the focal point for your home’s exterior. It is often the first thing noticed by guests, so you want to be sure it makes a good first impression. 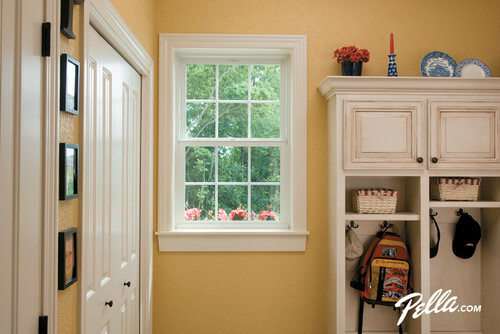 Updating your doorway with paint or new hardware is a great way to personalize your entryway. 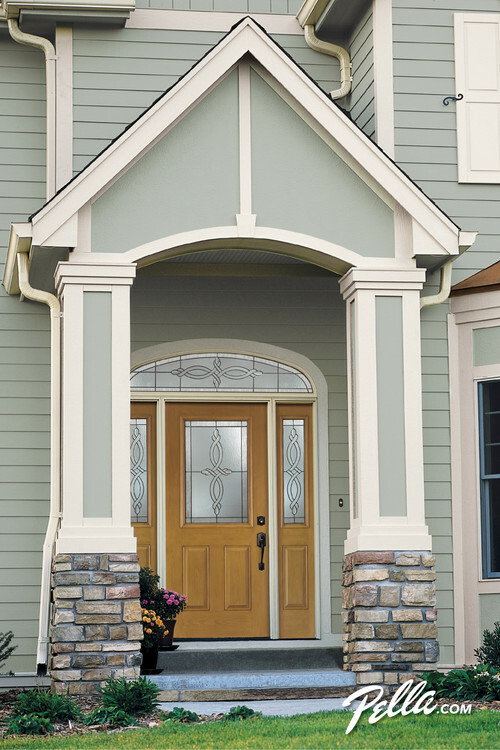 If your entry door is in disrepair and needs replacing, or if you desire a fresh look for your home, you might want to consider replacing your door. 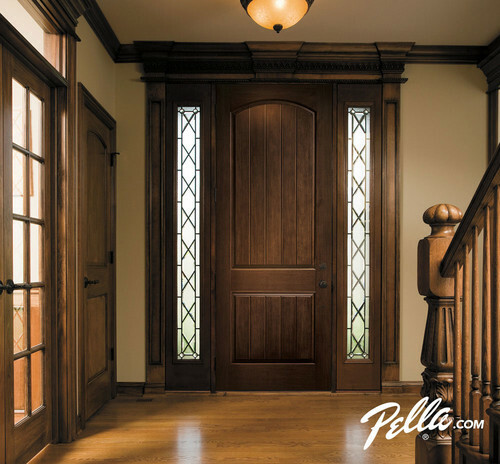 Check out these door options from Pella to find a style that best fits your home. Good lighting in your entryway on both the interior and exterior of your home is important not only for aesthetic reasons but for safety. A well-lit space will help keep you and your guests safe when coming and going from your home in the evenings. Chandeliers, sconces, and pendants are all great lighting options as you step inside. Be sure to choose a light fixture that complements your space and your design style. If overhead lighting isn’t an option, a floor lamp, or set of table lamps can be a lovely addition to your foyer. 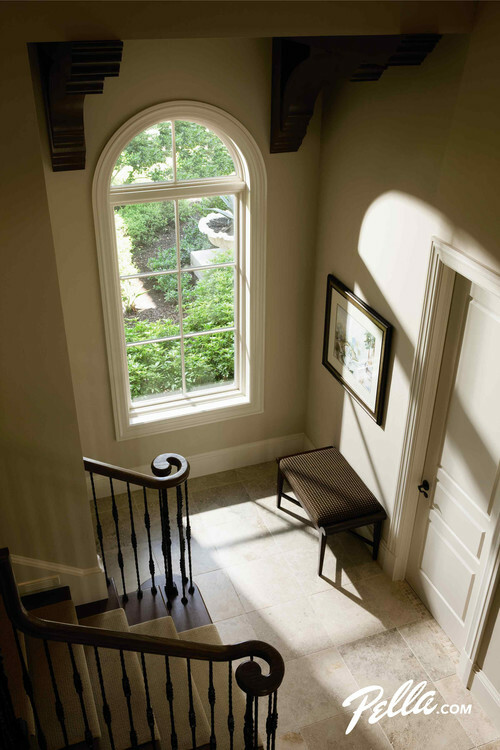 You might also consider adding a decorative window or a mirror to a small entryway to provide more natural light and give the illusion of a larger space. Finding a stylish storage solution for all of your belongings is imperative to keeping a beautiful and functional entryway. No one likes to be greeted at the door by a mess! If there is not a coat closet in the foyer, or if it does not supply adequate storage, attach coat hooks to a wall or place a coat-rack in the corner. Sports equipment, gloves, scarves, hats, etc. can be neatly hidden in wicker baskets or storage bins. Use your vertical space wisely in tight entries and choose furniture pieces, such as console tables, that have a low profile. Entryways are the perfect places to have fun with paint, wallpaper, a stencil, or a feature wall. Remember that you want to introduce your guests to your home’s story, so don’t be afraid to show some personality. 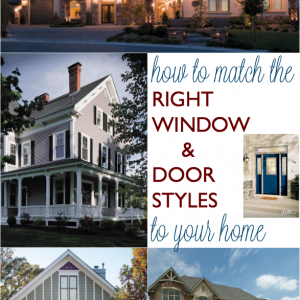 Choose colors that are in line with the adjacent rooms. The picture below is stunning. The entryway door, millwork, hardwood floors and chunky moldings make my heart go pitter-patter. However, in spite of its warmth and charm, this entryway lacks personality. Who lives here? What stage of life are they in? What are their interests? By changing out the light fixture and adding a rug, artwork, plant, seating option and a few personal items, you can completely change the look and feel of your foyer. 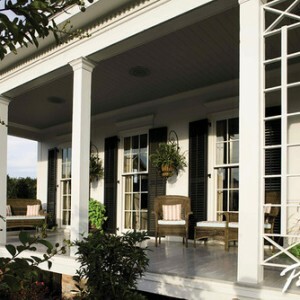 Accessories play a very important part in telling your home’s story. Stinky sneakers and wet dog are not welcoming smells for you or your guests. You ideally want to be greeted with pleasantness upon walking through the front door, and that includes what you can and can’t smell. A scented candle, plug-in, essential oil diffuser, or other air freshener placed in your entryway will help set the mood for your home and mask any unpleasant odors. Pick a scent that is not overpowering – such as citrus, vanilla, or lavender – that you want to associate with home. 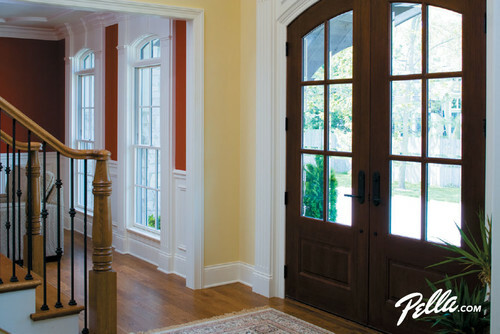 For more entryway inspiration, check out Pella on Pinterest and Houzz. 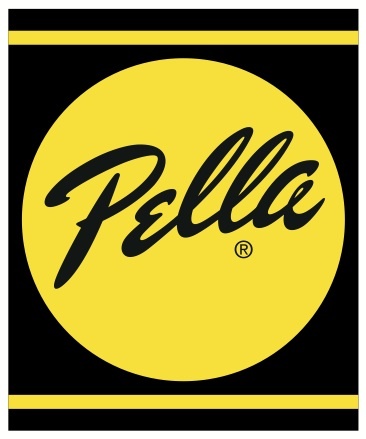 This post is sponsored by Pella® . All opinions are my own. I love these ideas for creating the ideal entryway. I am a big believer in lighting and the effects it can have on every area in your home.